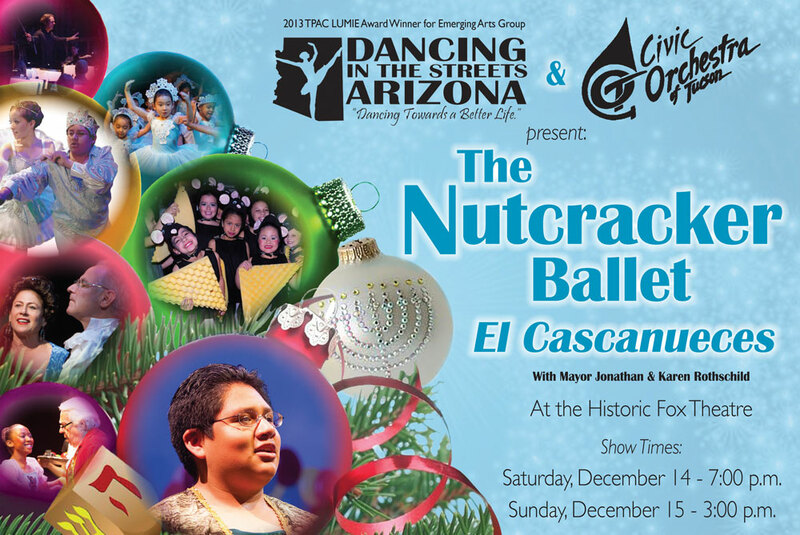 Tucson, AZ (September 3, 2013) — On Saturday and Sunday, December 14 and 15, Dancing in the Streets Arizona (DITSAZ) will present a boldly re-envisioned version of The Nutcracker ballet set to live music provided by the Civic Orchestra of Tucson. Saturday’s performance is scheduled for 7:00 p.m. The Sunday matinee is scheduled for 3:00 o’clock. Both performances will take place at the Historic Fox Theatre at 17 West Congress Street in Tucson. Tickets, which are available through the Fox box office, start at $13. Given the lush and familiar Tchaikovsky score, the magnificent and humorous classical choreography, the thrill of witnessing the wonderful talent of our community’s young dancers, and the intimacy of the historic Fox Theatre, the DITSAZ production promises to provide outstanding entertainment for children and theatre-goers of all ages. Back by popular demand will be Mayor Jonathan Rothschild and his wife, Karen, who will perform alongside other community leaders whose identities are still a surprise. This ballet has become an new annual tradition for many of our South Tucson families,” said Founder/Artistic Director Joseph Rodgers “Our cast is the most diverse group of dancers in all of greater Tucson,” Time after time, children of all ages are delighted by the danced version of the classic E.T.A. Hoffmann tale, featuring the magical toymaker Herr Drosselmeier, Claire, her beloved Nutcracker Prince, twirling Snowflakes, and battling mice. It’s an adventure not to be missed! 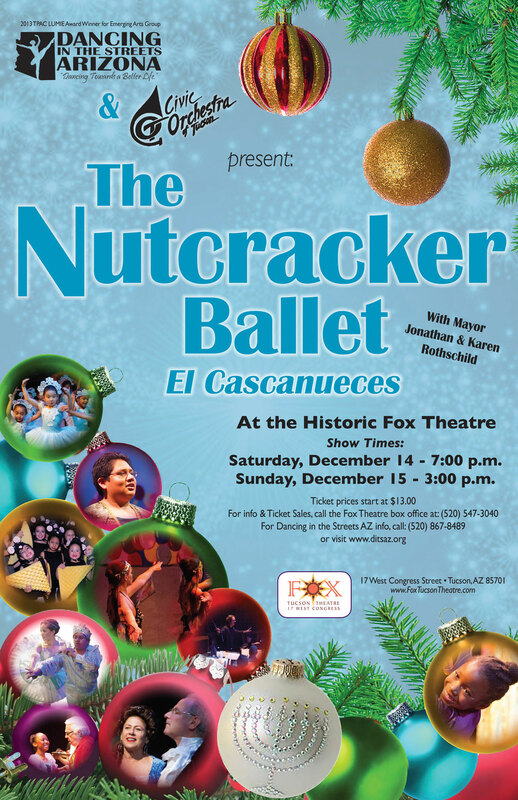 The Nutcracker is the perfect way to introduce young children to the power and beauty of classical dance.